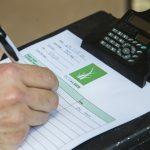 In understanding the cost of artificial grass, it is helpful to have background information on everything that goes into an installation, from estimate and design phase to installation. 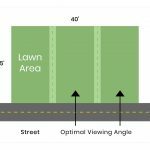 For this example, let’s assume we are working with a 1,000 square foot lawn, and will be removing a traditional lawn and installing artificial grass. The first step is for us to visit the project site, take measurements and draw up a site plan. With the layout of the turf, we aim to maximize the ‘optimal viewing angle’ of the turf and minimize waste. On average, there is usually 10-20% waste on turf projects. The waste factor will vary depending on the shape of your project. For instance, a “pie shaped” yard will generate a lot more waste than a rectangular yard. The turf is rolled out like carpet and typically comes in 15-foot widths. In this example, the seams are drawn with a dotted line. There are four main costs that make up an artificial grass project: materials, operational costs, labor, and company overhead. A synthetic grass estimate will list the costs for the materials and labor needed to complete the job, and should be enough to cover operational expenses for the project as well as contribute to paying the company overhead. EcoLawn recommends using these materials at a minimum to ensure the longevity and the appearance of the installation. Other materials can be substituted for either a premium installation or budget installation. Brown Poly Board is a mid-level edging option, available in 2” x 4” x 20’ pieces. Other options: a natural edge (no edging), steel header (premium). One stake is needed for every two feet of edging. 1 roll of weed barrier covers 1500 square feet. We install 3-4” of Class II Recycled Road Base, which is a mixture of recycled concrete, sand, rocks. This is compacted down to ensure a hard, flat surface for the grass that will not be compromised with time, while allowing permeating of water to trickle down to the water table. **This is the most important part of the installation! Without a proper base, you risk your lawn looking lumpy after some time. ¼” Decomposed Granite on top of the road base, and compacted down, ensures a smooth surface. Prices and styles vary. Must account for waste when ordering. We use reputable manufacturers who stand behind their product and provide the best warranty. We use 5” galvanized nails, every 6” around the edge and 12-24” in the field. We use a 50-50 blend of silica sand and volcanic ash. One and half pounds of infill per square foot. Dump fees vary depending on the weight of the load, whether it is mostly grass, whether the material is wet, if there is concrete or other debris that is included. For an average 1,000 square foot lawn, we would have roughly two trips to the dump (two truckloads of grass and dirt). Fueling costs vary depending on the proximity to the dump, trips needed for material runs, and the weight of the materials that we hauling away. A typical installation will receive 2-3 deliveries with varying costs, depending on the vendor. For this example, we will assume 2 deliveries, for the grass material and substrate materials. Labor is a large part of the cost as every aspect of the project is done by hand or by wheelbarrow, sometimes with the aid of a machine. Labor costs account for: old grass removal, export of old materials and import of new, grading, drainage, installing edging, moving, cutting and nailing the grass material, spreading infill, etc. Our labor costs are greatly determined on the difficulty level of the installation. An “easy” installation would be a project with easy access and very little detail work. A “difficult” installation would be one with difficult access and lots of detail work. At EcoLawn, a 1,000 square foot job will take a 10-person crew one day to complete the installation, from lawn removal to turf installation. We consider this to be what “keeps the lights on” for the company. This includes, but is not limited to: worker’s compensation and general liability insurance, automotive expenses, equipment and tools, office rent, etc. Once the entire overhead is paid, what is left over, if anything, is the company profit. You get what you pay for in terms of the long-term durability and integrity of your project. There are installers who have been installing artificial grass for 6-12 months and there are installers who have been installing turf for years, day in and day out. If you want to get your installation done right the first time and never have to think about it again, we recommend a solid installation crew to install your project. The EcoLawn team specializes in artificial grass installation and is a professional, well-oiled machine. We are licensed, bonded and insured and pay our employees fair and equitable salaries. Approximately 90% of our standard grass installations in Santa Barbara County fall within the price range of $9 to $12 per square foot. Included in this price range: removal of old landscape (dead grass, dirt, etc. ), installation of base layer and artificial grass, labor and materials. Factors that affect the price: difficulty of installation, project size and scope, and material selection. Want to know what your project will cost?